There are five great auspicious yogas in Vedic astrology. They are known as PANCH MAHAPURUSH YOGA. Dev Guru Brihaspati or Jupiter, DAITYA guru Shukracharya (Shukra or Venus), Mars, Saturn and Mercury create Panch Mahapurush Yogas in horoscopes .The great Sage Varaha Mihir mentioned and described in his book “Brihat Samhita”about all these five yogas. 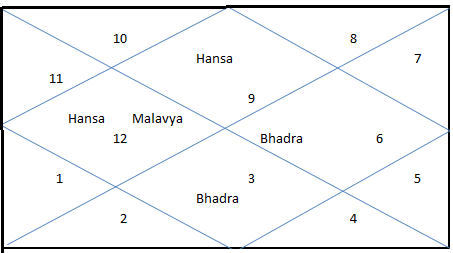 While considering any Yoga or Planetary combination in a horoscope, the strength (in Sad Bal and Ashtak varg), and relation with the lord of ascendant in Panchadha Maitri chart must be calculated. The yogas will benefit in their Mahadasha, Antardasha and Pratyantardasha. HANSA YOGA—this yoga is created by Jupiter. If Jupiter is placed in Centre or Kendra in own sign (Sagittarius or Pieces) or exalted (Cancer or Karka rashi), HAMSA Yoga is created in the horoscope. MALAVYA YOGA—This yoga is created by Venus. If Venus is placed in center or Kendra in own sign (Taurus or Libra) or exalted (Pieces or Meen rashi), MALAVYA Yoga is created in the horoscope. RUCHAKA YOGA—this yoga is created by Mars. If Mars is placed in center or Kendra in own sign (Aries or Scorpio) or exalted (Capricorn or Makara rashi), RUCHAKA Yoga is created in the horoscope. SHASHA YOGA—this yoga is created by Saturn. If Saturn is placed in center or Kendra in own sign (Capricorn or Aquarius) or exalted (Aquarius or Kumbha rashi), SHASHA Yoga is created in the horoscope. BHADRA YOGA—this yoga is created by Mercury .If Mercury is placed in Center or Kendra in own sign (Gemini or Virgo) or exalted (Virgo or Kanya rashi), BHADRA Yoga is created in the horoscope. 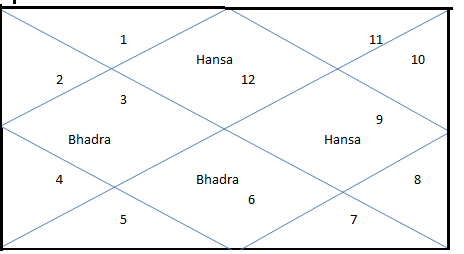 HANSA YOGA–In Mesh Lagna or Aries ascendant if Jupiter is placed in 4th place (center) the native will experience the benefit of this yoga in his/her life time.Effects—By the existence of this yoga the native will get love and respect in life. The native will be very well known and popular. The native will have a very strong character and will be a person of principles. The native will have a clear mind and be a lover of justice. MALAVYA YOGA—In Mesh lagna or Aries ascendant, if Venus is placed in 7th place the native will experience the benefit of this yoga in his/her life time.Effects—By the existence of this yoga, the native will have very strong personality and will be rich. The native will lead a very luxurious life along with his family. He or she will be famous, clear in thinking and a scholar. RUCHAKA YOGA—in Mesh lagan or Aries ascendant if Mars is placed in lagna or 10th place the native will experience the benefit of this yoga in his/her life time. Effects— Due to the existence of this yoga, the native will have very strong and attractive physic and will be famous and wealthy. He will be commanding by nature .He will get an authoritative position in life. The native will be a good administrator. 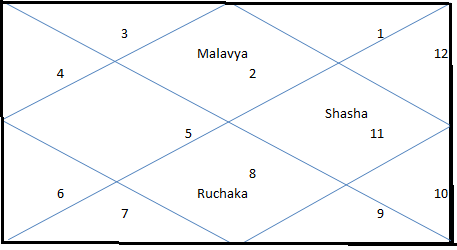 SHASHA YOGA—in Mesh lagna or Aries ascendant if Saturn is placed in 7th or 10th place the native will experience the benefit of this yoga in his/her life time.Here, the placement of Moon must be taken into consideration. Effects—by the existence of this yoga, the native will get a position of authority .The native will be rich and may be a very powerful person. BHADRA YOGA—this yoga is not possible to form in this lagna. HANSA YOGA— this yoga is not possible to form in this lagna. MALAVYA YOGA—In Vrishabha lagna or Taurus ascendant, if Venus is placed in 1st place( ascendant) the native will experience the benefit of this yoga in his/her life time.Effects–By the existence of this yoga, the native will have very strong personality and will be rich. The native will lead a very luxurious life along with his family. He or she will be famous, clear in thinking and a scholar. RUCHAKA YOGA—in Vrishabha lagan or Taurus ascendant if Mars is placed in 7th place the native will experience the benefit of this yoga in his/her life time. Effects— Due to the existence of this yoga, the native will have very strong and attractive physic and will be famous and wealthy. He will be commanding by nature .He will get an authoritative position in life. The native will be a good administrator. 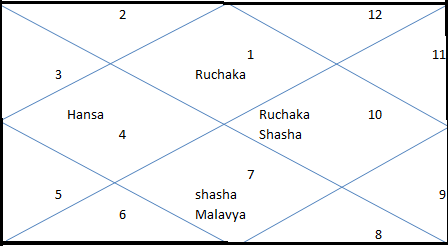 SHASHA YOGA—in Vrishabha lagna or Taurus ascendant if Saturn is placed in 10th place the native will experience the benefit of this yoga in his/her life time.Here, the placement of Moon must be taken into consideration.Effects—by the existence of this yoga, the native will get a position of authority .The native will be rich and may be a very powerful person. 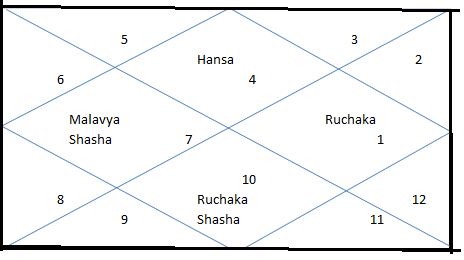 HANSA YOGA—in Mithun Lagna or Gemini ascendant if Jupiter is placed in 7th or 10th place (center) the native will experience the benefit of this yoga in his/her life time.Effects—By the existence of this yoga the native will get love and respect in life. The native will be very well known and popular. The native will have a very strong character and will b a person of principles. The native will have a clear mind and be a lover of justice. MALAVYA YOGA— in Mithun Lagna or Gemini ascendant, if Venus is placed in 10th place ,the native will experience the benefit of this yoga in his/her life time.Effects–By the existence of this yoga, the native will have very strong personality and will be rich. The native will lead a very luxurious life along with his family. He or she will be famous, clear in thinking and a scholar. RUCHAKA YOGA— this yoga is not possible to form in this lagna. SHASHA YOGA— this yoga is not possible to form in this lagna. BHADRA YOGA— in Mithun Lagna or Gemini ascendant, if mercury is placed in 1st place( ascendant) or 4th place the native will experience the benefit of this yoga in his/her life time.Effects–By the existence of this yoga, the native will have good skin,well built chest, will be eqanimus,have logical communication,will be learned , be a connoisseur of arts and will have gratitude . HANSA YOGA—in Karka Lagna or Cancer ascendant if Jupiter is placed in 1st place (ascendant) the native will experience the benefit of this yoga in his/her life time.Effects—By the existence of this yoga the native will get love and respect in life. The native will be very well known and popular. The native will have a very strong character and will be a person of principles. The native will have a clear mind and be a lover of justice. MALAVYA YOGA— in Karka Lagna or Cancer ascendant, if Venus is placed in 4th place the native will experience the benefit of this yoga in his/her life time.Effects–By the existence of this yoga, the native will have very strong personality and will be rich. The native will lead a very luxurious life along with his family. He or she will be famous, clear in thinking and a scholar. RUCHAKA YOGA—in Karka Lagna or Cancer ascendant if Mars is placed in 7th or 10th place the native will experience the benefit of this yoga in his/her life time.Effects— Due to the existence of this yoga, the native will have very strong and attractive physique and will be famous and wealthy. He will be commanding by nature .He will get an authoritative position in life. The native will be a good administrator. SHASHA YOGA— in Karka Lagna or Cancer ascendant if Saturn is placed in 4th or 7th place the native will experience the benefit of this yoga in his/her life time.Here, the placement of Moon must be taken into consideration.Effect—by the existence of this yoga, the native will get a position of authority .The native will be rich and may be a very powerful person. BHADRA YOGA— not possible in this lagna. HANSA YOGA—This yoga is not possible to form . MALAVYA YOGA—In simha lagna or Leo ascendant, if Venus is placed in 10th place the native will experience the benefit of this yoga in his/her life time. Effects–By the existence of this yoga, the native will have very strong personality and will be rich. The native will lead a very luxurious life along with his family. He or she will be famous, clear in thinking and a scholar. RUCHAKA YOGA—in simha lagna or Leo ascendant if Mars is placed in 4th place the native will experience the benefit of this yoga in his/her life time. Effects— Due to the existence of this yoga, the native will have very strong and attractive physic and will be famous and wealthy. He will be commanding by nature .He will get an authoritative position in life. The native will be a good administrator. SHAHSA YOGA—in simha lagna or Leo ascendant if Saturn is placed in 7th place the native will experience the benefit of this yoga in his/her life time.Here, the placement of Moon must be taken into consideration.Effects—by the existence of this yoga, the native will get a position of authority .The native will be rich and may be a very powerful person. 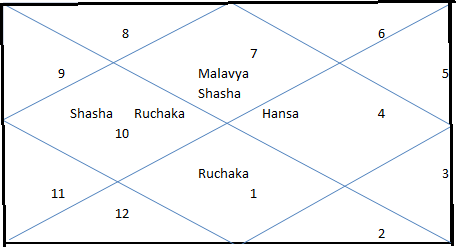 HANSA YOGA–In Kanya Lagna or Virgo ascendant if Jupiter is placed in 4th or 7th place (center) the native will experience the benefit of this yoga in his/her life time.Effects—By the existence of this yoga the native will get love and respect in life. The native will be very well known and popular. The native will have a very strong character and will be a person of principles. The native will have a clear mind and be a lover of justice. MALAVYA YOGA—In Kanya lagna or Virgo ascendant, if Venus is placed in 7th place the native will experience the benefit of this yoga in his/her life time. Effects–By the existence of this yoga, the native will have very strong personality and will be rich. The native will lead a very luxurious life along with his family. He or she will be famous, clear in thinking and a scholar. RUCHAKA YOGA—This yoga is not possible to form. SHAHSA YOGA—This yoga is not possible to form. BHADRA YOGA—— in kanya Lagna or Virgo ascendant, if mercury is placed in 1st place( ascendant) or 10th place the native will experience the benefit of this yoga in his/her life time. Effects–By the existence of this yoga, the native will have good skin, well built chest, will be eqanimus ,have logical communication, will be learned , be a connoisseur of arts and will have gratitude . HANSA YOGA–In Thula Lagna or Libra ascendant if Jupiter is placed in 10th place (center) the native will experience the benefit of this yoga in his/her life time.Effects—By the existence of this yoga the native will get love and respect in life. The native will be very well known and popular. The native will have a very strong character and will be a person of principles. The native will have a clear mind and be a lover of justice. MALAVYA YOGA—In Thula lagna or Libra ascendant, if Venus is placed in 1st or ascendant place the native will experience the benefit of this yoga in his/her life time.Effects–By the existence of this yoga, the native will have very strong personality and will be rich. The native will lead a very luxurious life along with his family. He or she will be famous, clear in thinking and a scholar. RUCHAKA YOGA—in Thula lagna orLibra ascendant if Mars is placed in 4th or 7th place the native will experience the benefit of this yoga in his/her life time.Effects— Due to the existence of this yoga, the native will have very strong and attractive physic and will be famous and wealthy. He will be commanding by nature .He will get an authoritative position in life. The native will be a good administrator. 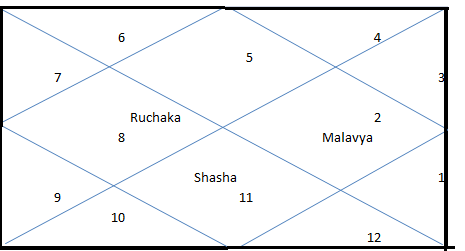 SHASHA YOGA—in Thula lagna or Libra ascendant if Saturn is placed in 1st(ascendant) or 4th place the native will experience the benefit of this yoga in his/her life time.Here, the placement of Moon must be taken into consideration.Effects—by the existence of this yoga, the native will get a position of authority .The native will be rich and may be a very powerful person. HANSA YOGA—this yoga is not possible to form. MALAVYA YOGA—In Brischik lagna or Scorpio ascendant, if Venus is placed 7th place the native will experience the benefit of this yoga in his/her life time.Effects–By the existence of this yoga, the native will have very strong personality and will be rich. The native will lead a very luxurious life along with his family. He or she will be famous, clear in thinking and a scholar. RUCHAKA YOGA—in Brischik lagna or Scorpio ascendant if Mars is placed in 1st place or ascendant the native will experience the benefit of this yoga in his/her life time.Effects— Due to the existence of this yoga, the native will have very strong and attractive physic and will be famous and wealthy. He will be commanding by nature .He will get an authoritative position in life. The native will be a good administrator. SHASHA YOGA—in Brischik lagna or Scorpio ascendant if Saturn is placed in 4th place the native will experience the benefit of this yoga in his/her life time.Here, the placement of Moon must be taken into consideration.Effects—by the existence of this yoga, the native will get a position of authority .The native will be rich and may be a very powerful person. HANSA YOGA–In Dhanu Lagna or Sagittarius ascendant if Jupiter is placed in1st or ascendant or 4th place (center) the native will experience the benefit of this yoga in his/her life time.Effects—By the existence of this yoga the native will get love and respect in life. The native will be very well known and popular. The native will have a very strong character and will be a person of principles. The native will have a clear mind and be a lover of justice. MALAVYA YOGA—In Dhanu lagna or Sagittarius ascendant, if Venus is placed in 4th place the native will experience the benefit of this yoga in his/her life time.Effects–By the existence of this yoga, the native will have very strong personality and will be rich. The native will lead a very luxurious life along with his family. He or she will be famous, clear in thinking and a scholar. RUCHAKA YOGA—This yoga is not possible to form in this Lagna. SHAHSA YOGA— This yoga is not possible to form in this Lagna. BHADRA YOGA— in Dhanu Lagna or Sagittarius ascendant, if mercury is placed in 7th or 10th place the native will experience the benefit of this yoga in his/her life time.Effects–By the existence of this yoga, the native will have good skin, well built chest, will be eqanimus ,have logical communication, will be learned,be a connoisseur of arts and will have gratitude . 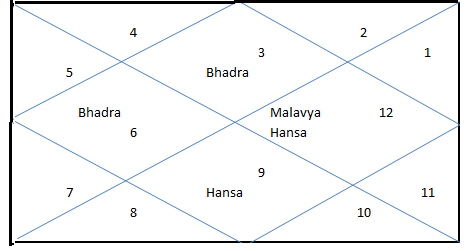 HANSA YOGA–In Makar Lagna or Capricorn ascendant if Jupiter is placed in 7th place (center) the native will experience the benefit of this yoga in his/her life time.Effects—By the existence of this yoga the native will get love and respect in life. The native will be very well known and popular. The native will have a very strong character and will be a person of principles. The native will have a clear mind and be a lover of justice. MALAVYA YOGA—In Makar lagna or Capricorn ascendant, if Venus is placed in 10th place the native will experience the benefit of this yoga in his/her life time.Effects–By the existence of this yoga, the native will have very strong personality and will be rich. The native will lead a very luxurious life along with his family. He or she will be famous, clear in thinking and a scholar. RUCHAKA YOGA—in Makar lagna or Capricorn ascendant if Mars is placed in 1st place or ascendant or 4th place the native will experience the benefit of this yoga in his/her life time.Effects— Due to the existence of this yoga, the native will have very strong and attractive physic and will be famous and wealthy. He will be commanding by nature .He will get an authoritative position in life. The native will be a good administrator. SHASHA YOGA—in Makar lagna or Capricorn ascendant if Saturn is placed in 1st or 10th place the native will experience the benefit of this yoga in his/her life time.Here, the placement of Moon must be taken into consideration.Effects—by the existence of this yoga, the native will get a position of authority .The native will be rich and may be a very powerful person. HANSA YOGA—This yoga is not possible to form in this Lagna. MALAVYA YOGA—In Kumbh lagna or Aqarius ascendant, if Venus is placed in 4th place the native will experience the benefit of this yoga in his/her life time.Effects–By the existence of this yoga, the native will have very strong personality and will be rich. The native will lead a very luxurious life along with his family. He or she will be famous, clear in thinking and a scholar. RUCHAKA YOGA—in Kumbh lagan or Aquarius ascendant if Mars is placed in 10th place the native will experience the benefit of this yoga in his/her life time.Effects— Due to the existence of this yoga, the native will have very strong and attractive physic and will be famous and wealthy. He will be commanding by nature .He will get an authoritative position in life. The native will be a good administrator. SHAHSA YOGA—in Mesh lagna or Aries ascendant if Saturn is placed in 1st place or ascendant the native will experience the benefit of this yoga in his/her life time.Here, the placement of Moon must be taken into consideration.Effects—by the existence of this yoga, the native will get a position of authority .The native will be rich and may be a very powerful person. HANSA YOGA–In Meen Lagna or Pieces ascendant if Jupiter is placed in1st or ascendant or 10th place (center) the native will experience the benefit of this yoga in his/her life time.Effects—By the existence of this yoga the native will get love and respect in life. The native will be very well known and popular. The native will have a very strong character and will be a person of principles. The native will have a clear mind and be a lover of justice. MALAVYA YOGA—This yoga is not possible to form in this Lagna. Please send your birth details(Date ,Time and Place of Birth). I will explain why your Yogas are not effective. can you tellme when i can enjoy bhadra yoga .iam sending my horoscope details. place of birth -kochi,kerala . also).The most effective time period will be from 2026 to 2028. Do I have any strong yoga in my kundali? You have many good yogas. Chandra-mangal Yoga is one of them. you have Hamsa yoga in your horoscope. good effect of the yoga uninterruptedly. Normally I like to take the lead, but when a leadership position is given, something tends to go wrong or something else due to which I get viewed as not such an effective leader. Why does this happen despite having a Ruchak yoga in my kundli? birth details(time,place and date of birth). You will get the benefit of Hamsa yoga.But,as Jupiter is afflicted by Rahu ,hence creating an inauspicious yoga.First ,do the remedy of Guru Chandal dosh to get the benefit of Hamsa Yoga. date of birth,time of birth, and Place of Birth. I have shasha yoga in my chart (Scorpion ascendant) but I have never experience such things in my life. In Scorpio ascendant ,Saturn creates SHASHA yoga if placed in Aquarious. 12 seconds, so Saturn is weak.Saturn is not able to give effect of Shasha Yoga. Does exalted venus in 1st house(Meena Lagna) cause Malavya yoga in pisces Lagna? Exalted Venus Create MALAVYA yoga if placed in lagna. sir is there any bhadra yog or budhaditya yog is forming in my kundli?is there any chance to do job in foreign countries? In your horoscope, Bhadra Yoga is not formed. Budhaditya yoga is also not Formed. Regarding your Foreign Job ,chances are there. 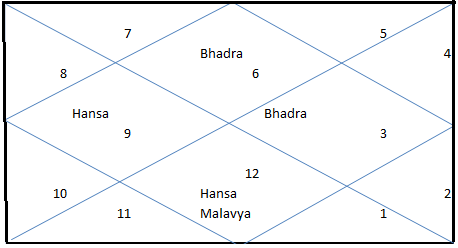 I have gajkesari, Shasha yog & Hans yog in my chart. I faced lot of difficulty during Jupiter mahadasa but results are better in Saturn Mahadasa. I want to change my job but not getting opportunity. I want to know when shall I get that. I understand that I have Malavya Yoga with Venus exalted in 4 th House , Dhanush Lagna and running Venus maha dasa. Please help me know if I will be able to enjoy the benefits of Malavya Yoga. Thanks in advance!! Your article was very informative. I am looking to know about my career and family life. We live abroad and are there chances of foreign settlement. You have two auspicious and fortunate yogas. 2.Gajakeshari Yoga–Very auspicious and fortunate yoga. You must do remedy for both these two inauspicious yogas. sir i am sougata mondal my date of birth is 26/08/1990 time 6-55 am kolkata. i found that i have hamsa yoga gaj kesari yoga but degree wise budh aditya yoga not applicable. my jupiter is exalted but in lower degree. 2nd 9th 11th house combination meaning good wealth and also saturn in 4th house. my saturn period is running. but i am not wealthy person. i am very poor. i am a accountant. but many times i change my jobs. please sir tell me when i become rich and making our own house. I have suggested to wear a pokhraj 5 carrat but it is very costly. and suggested for red coral 8-10 ratti and emithyst 8-10ratti. Sir , can u tell me that is there any yoga in my kundali to be an actor or not ? Which yoga are formed in my birth chart? 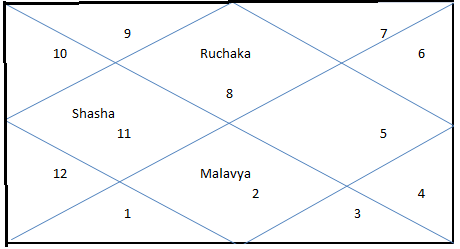 No PANCHA MAHAPURUSA YOGA formed in your chart. Why still not working any yoga? So many troubles those years..
Can u tell when I enjoy bhadra yog and other yog? you have Bhadra Yoga in your horoscope. When will i get job. But i m quite confused because the lagan changed from meen to mesh in between above tym. Hi, I have rochak yoga & malvya yog in lagna & sasha yog in navmans. I have not experienced any big difference. could you share your wisdom, if planet have strength to deliver result. Thanks. Your good time will come after 2059. Ruchak yoga will definitely give you good result. You should do business in your spouse’s name. In your kundali ,Mercury seems to form BHADRA YOGA. bUt,Mercury is 29 degree. Hence not able to give its effects. What are the auspicious and inauspicious yogas and when will they give their results? Please check the horoscope and tell me when they will give effective results. For the time when the yogas will give their result ,detail study of horoscope required. Your son has many auspicious yogas in his birth chart. which should be rectified as early as possible. Please tell me about my life, my marital life and would be spouse. Right now i am single. Time 10.47 pm Chennai . What all yogas there in my chart and how is present period have faced lots of sorrows financial debt failure and health issues from 2000 till now . you were under Saturn Mahadasha(1997 to 2016). Now you are under the Mahadasha of Mercury. P0litical career will be good. you need a thorough study of your horoscope. My DOB is 20/6/1986 and time of birth is 5 am. Place of birth is Allahabad, UP. Please let me know about the auspicious yogas in my kundli, about career and future life predictions. Two auspicious yoga created in your horoscope. it require detail study with minimal fees of Rs 1001.
i have sasa yoga and ruchika yoga.my saturn mahadasha period is starting now. my date of birth 1982,dec 30,2.30a.m. still in my life i never seen any kind of achivement or success.though i am a lawyer. Can you please analyze my daughter’s horoscope? Malavya Yoga has been created in your horoscope. Why am I unlucky if I have one or two of these? I saw online that my luck will come after middle age but trust me, in my place you’d also wish your middle age was now if thats when good luck and love are.. Please let me know what the problem is.. Your luck will favour you in 2031, only when you will try to build your by yourself.You will be a self-made person. My daughter’s still not yet married and having career issues. She has Hans Mahapurush Yog in Lagna and Guru mahadasha going on currently …. When will she get married and have good business/job? I have not been settled in my life in any terms,Not as per my career nor I have been married.Do I have any Raj yoga or Laxmi yoga or sash Maha purush yoga which will change my life as I am struggling a lot in my life and things r not working.At this moment I am job less too..Plz help..
in the evening or at night. Shasha yoga is going to start it’s effect within 7th of September 2018. Your son has bipareet Raj yoga,which will be beneficial for him. He has some auspicious yoga’s also. But sir one local astrologer told that he has hansa and gadkari yoga kalsarp yoga budha diya yoga parivartan yoga kendra trikon yoga mahabhag ya yoga and vipreet yoga etc. Is it true or not. You wanted to know about Raj yoga.so it is beeparit Raj yoga. I mentioned that some auspicious yoga’s are there also. Hansa yoga, gajakeshari,budhaditya,bandhupujya yoga.He has some inauspicious yoga like kalsarp Dosh. He has Sasha yoga in his horoscope. Your husband has shasha yoga in his birth chart. It will be activated in between june 2022. My name is Anirudh ,dob is 27th jan 1985 ,4:40 pm dehradun .I have malvya yog but i didn’t enjoy much of the effects during venus mahadasha. I am still empty handed . Though it seems as creating Malavya yoga by Venus,Venus is in 00:45’32”.So,you have not got it’s result. This is anirudh thakur d.o.b 16 June 1992 4:30 pm place of birth Chandigarh? Do I have shasha yoga and Ruchaka yoga? When will I become IAS officer? You have Ruchak yoga . You have also shasha yoga with lesser effect.Regarding job,you may not get higher administrative job. Thanku for reply…can I get other post like Indian revenue service or Indian audit and account service etc..or will I remain in the present govt. clerical line? My name is Anirudh Thakur d.o.b 16 June 1992 time 4:30 pm Chandigarh…do I have ruchaka and Sasa yoga and how much effective? When will I become IAS officer? Dear sir, I have Sada yoga in cancer ascendant. Please tell me when it will take fully effect in my life since I’m going through lot of hardship. You have shasha yoga in your birth chart. Since you are facing lots of problem,you need to check your horoscope thoroughly. My name is Kamal and my date of birth is 11-05-89, place of birth- trichy and time-1:15pm,I am having malavya yoga and my Venus dasha starts next year 2019,how those 20 yrs would be? Your Venus mahadasha will start from 2019 for 20 years.You will get the benefit of malavya yoga, definitely. Under every mahadasha there are many antardasha also,which give different results. not get the benefit of hamsa Yoga. 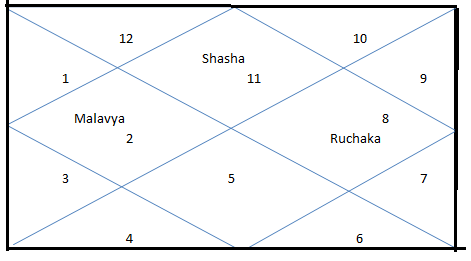 If shukra(14.22° tula rashi) and rahu(19.41° tula rashi) conjunction is there in 7th house (mesh lagna meen rashi kundli) , will it give good result in Venus mahadasha ???? Pls do ans as many astrologer says malaviy will not get activated in mesh lagna…. Pls do clear this ?? My name is Suray Kumar. I am preparing for civil services. My aunt told me that I have Shash Yoga in my birth-chart. Please guide me. 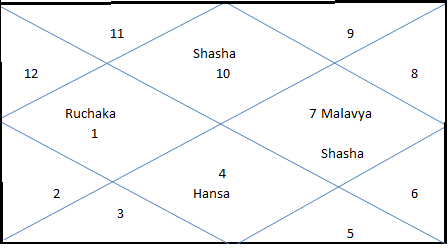 You have Shasha yoga in your chart. You may try for Civil service. I have Bhardayoga in my horoscope.Is it effective( as mercury is malefic for my ascendant)?If effective when it will give results.Can i go to foreign country for higher education? Your Bhadra Yoga will be effective after December,2018. Regarding higher education in foreign country,the chance is less. Please provide any remedy for higher education in foreign country. I have hamsa yoga when will I benefit. Hamsa Yoga is created by Jupiter. Jupiter is at 29 degree and Combust. So,the effectiveness will not be felt. its effectiveness with remedy) which is chargeable. I am cancer ascendant and I have “Shash Yoga” in 7th house of Capricorn where Saturn and Sun is sitting together. Saturn degree is 24 04′ 12″ while Sun degree is 00 37′ 40″. My question is because Saturn is having conjunction with Sun will this yoga be effective and at the same time my Mangal is sitting in 12 th house of Gemini so it aspects 7th house too. What can you say about it? will be effective in its Mahadasha. I was born 26/04/1988, do i hav any good yogas in my kundali, if yes there is no effect, when will i see any good effects. birth .Please share ,if you want to know yogas in your kundali. Dear sir i am from sri lanka. I was born on 12th august 1991. Birth time is 11.09am. Sodiac is Libra. Lots of astrologers tell I have a sasha yoga and guru hamsa yoga in my birth chart. But i don’t have any happy. I don’t have a money. I am weak from healthy. I am single at present. My i know what month i can find a some money? I love to one girl and her name is rovina menoli anthony. She was born on 05th March 2001. Her sidiac is Leo. I want to know can i marry her? What year I can marry? Please think sad about me and reply me sir. Big merit to you. I am a businessman. But my businesses was block from loans. Pl share your place of birth. Please tell any yoga formed in my horoscope? You have some auspicious yoga in your horoscope. These are CHANRDA MANGAL YOGA ,BUDHADITYA YOGA. I have some query about ‘ bhdra yoga ‘. It found Gemini or Virgo in 1,4,7,10 houses(kendra). other house in formed in bhadra yoga. If mercury planet is placed on 11 house(kona) with Gemini zodic . then how is it effect occured ? Bhadra Yoga is one of the Pancha mahapurusa yoga. with Gemini or Virgo sign. not the result of bhadra Yoga though in Gemini . What are my auspicious and inauspicious yogas ? Is there shasa yoga auspicious to me? Please check if I have any good or bad yoga and what profession I should pursue. Hi, do I have sash yog in my horoscope and when will it get activated? Hi, do i have shasha yoga, guru chandal dosh and vish yoga ? And what remedies you prefer to give? inauspicious yoga in your horoscope. The remedy for these two yoga is to recite mantra of Shiv ji. daily recite these two mantra. I want to know do I have any panacmahapurush yogas. Do I have strong raj yogas. Also do I have neech bhang raj yoga. If yes when will be benefited from these yogas. At what age I will start to succeed. 1 .Harsha Yoga–by this yoga ,you will be Lucky,happy,healthy,rich and famous. The effective time period has been already started. 2 .Sarala Yoga–It mkaes you intelligent and financially well off. The effective time period will be from April 2025 to June 2028. As per your given birth details,you have two Raj yoga in your horoscope. wealthy,Financial prosperity.You will be helping by nature. The effective time period will be from 2029 to 2030 and 2034-2036. I m born on 8 may 2001,kanpur uttar Pradesh ,10:30pm.i have malavya yoga but it is getting cancel due to Jupiter Saturn conjunction .wat is the remedy for this??? Malavya yoga is active in your horoscope. Do chant Guru mantra daily. Can I pls know about other auspicious yogas in my horoscope ? ?can I have a career in politics?? Hi, do I have buadra yoga? Any other yoga’s? You do not have Bhadra Yoga in your horoscope. You have two other yogas..
You have also Bish yoga. Do i have any yogas?